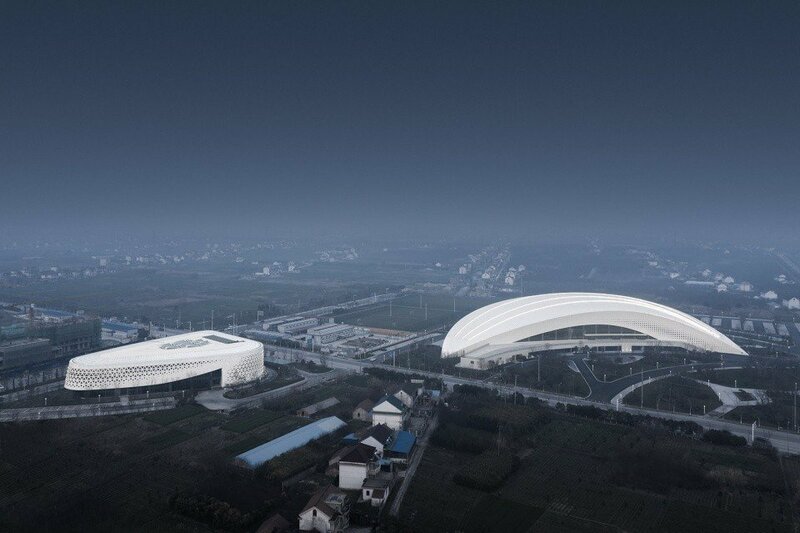 Rudong Sports Center is located in Rudong County New District, Nantong City, Jiangsu Province. 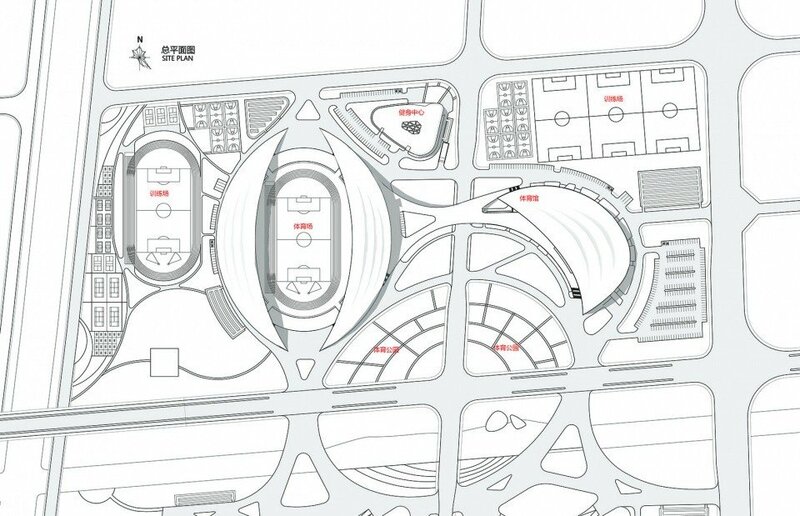 The project includes a gymnasium (including a swimming pool), a fitness center and a comprehensive stadium. 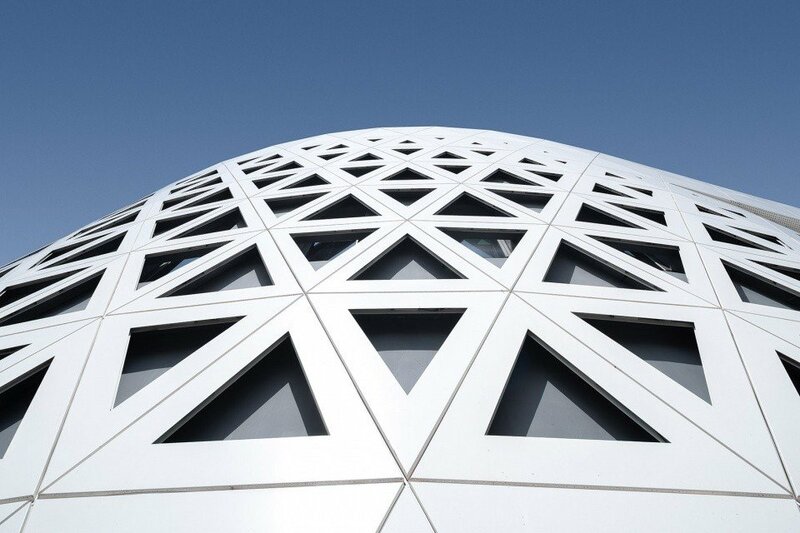 As part of the cultural core of the new district, it forms a symbol of the new district together with the cultural center group on the south side and will become an important driving force for the development of the new district. 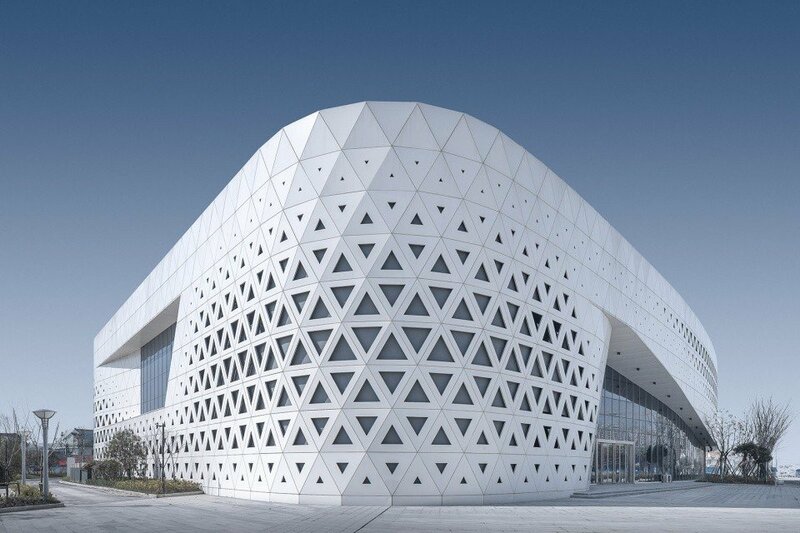 TJAD design group won the design competition in 2012, and the first phase of the project was completed in 2018. 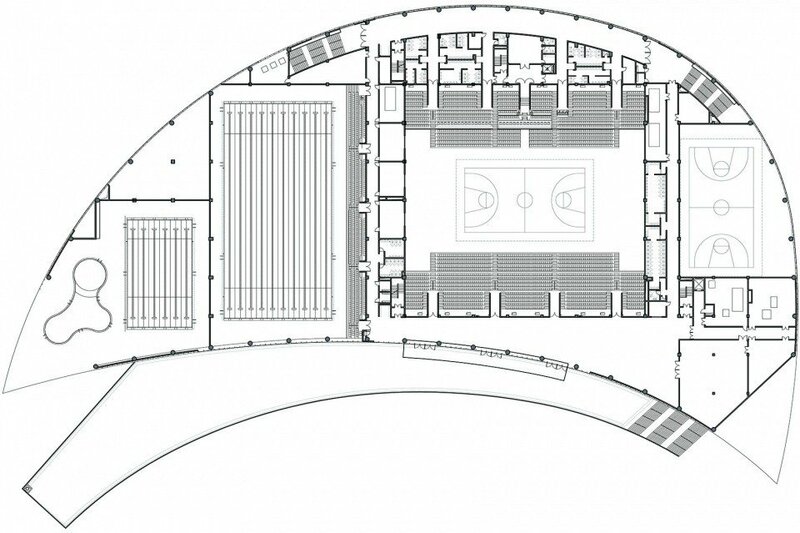 The design of the sports center is focused on open space and public participation. 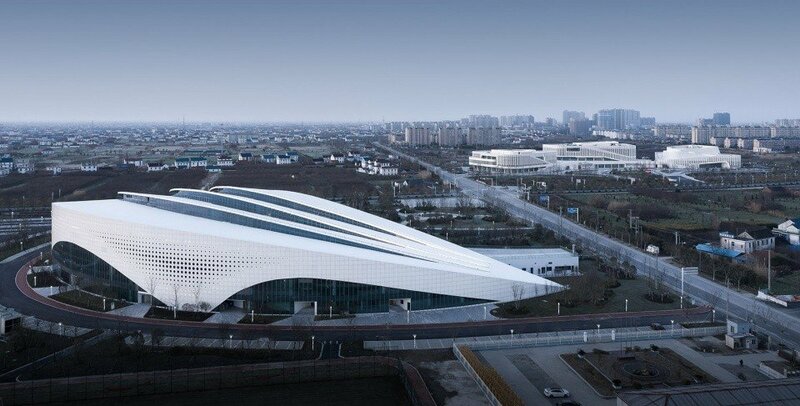 Therefore, the overall planning plan does not focus on architecture. 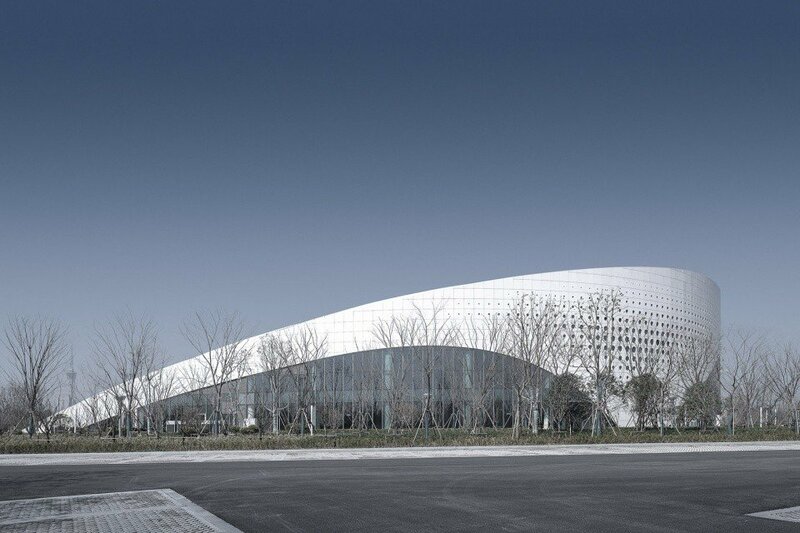 Instead, it uses buildings to surround sports parks for public activities and forms an organic whole with the cultural center on the south side. 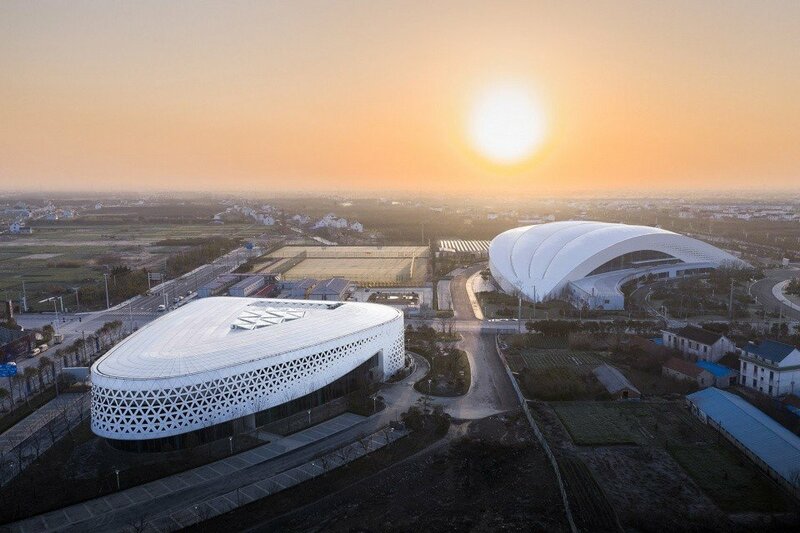 The open park has shortened the distance between the citizens and fitness facilities and has built a vibrant landscape space for the city. 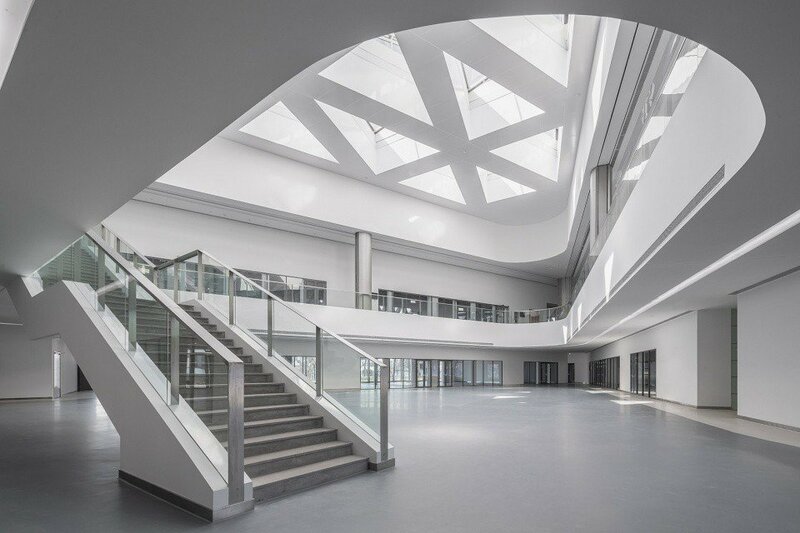 An overpass through the second-floor flyover connects the stadium and gymnasium. 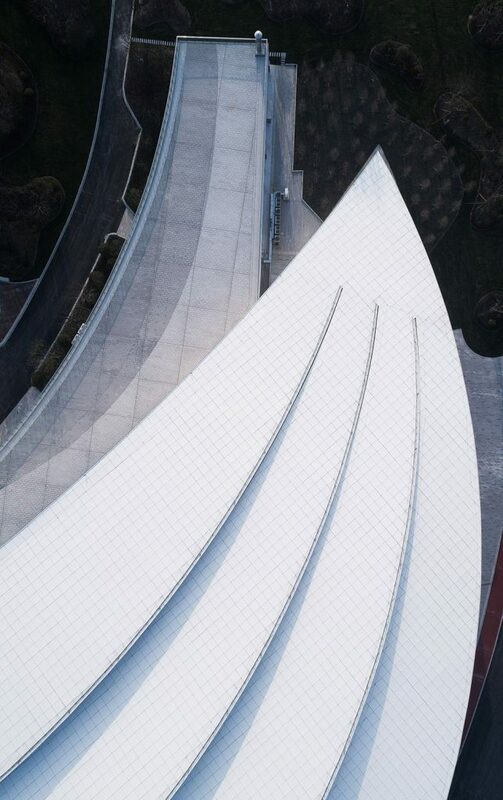 ▼An overpass connects the gymnasium and the stadium. 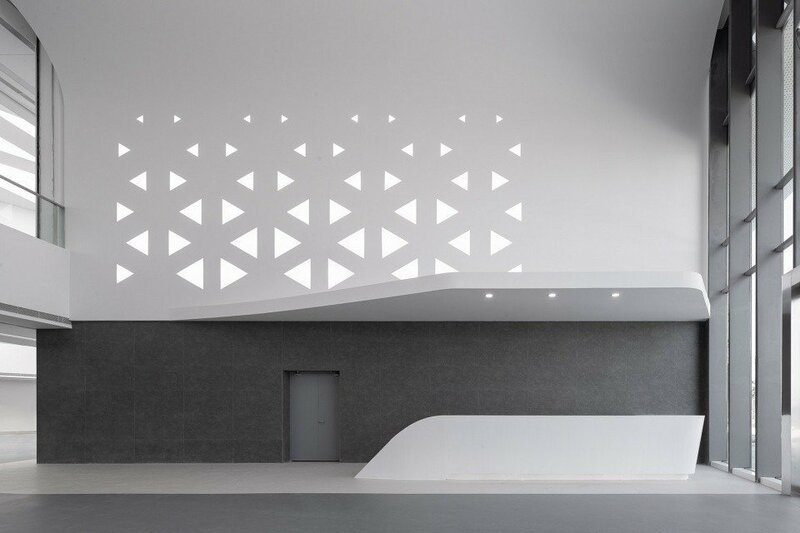 The high seas, wide and open geographical features bring unlimited inspiration to the design. 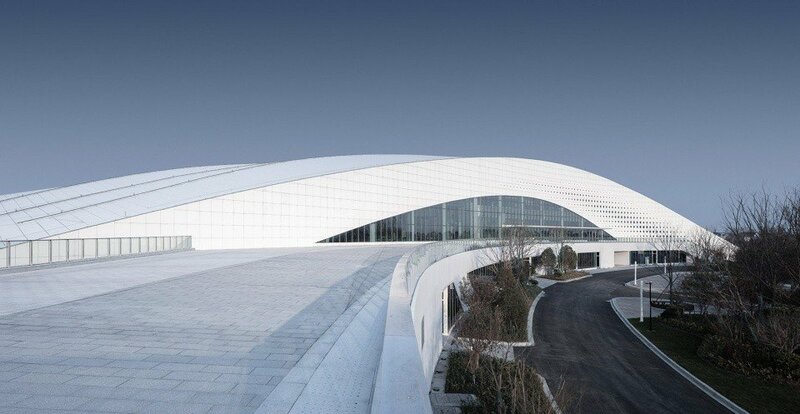 Stretching the flowing buildings like rolling white waves, the curvilinear shape of sports vitality and beauty. 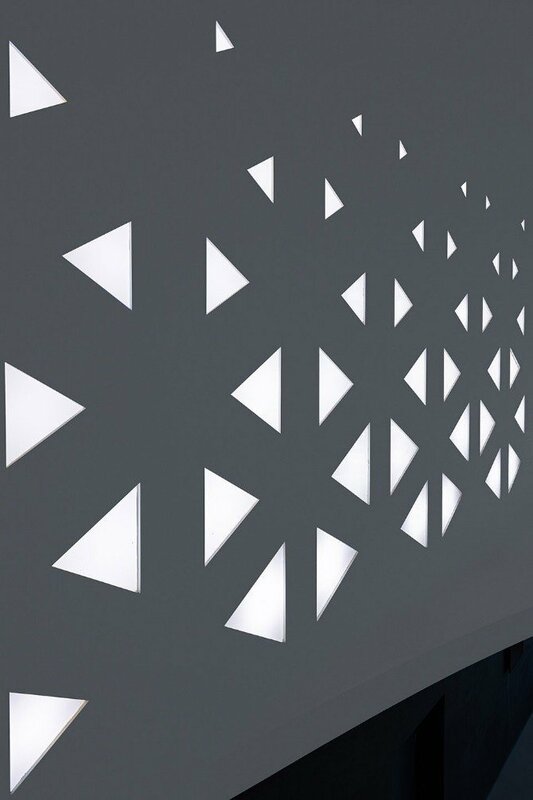 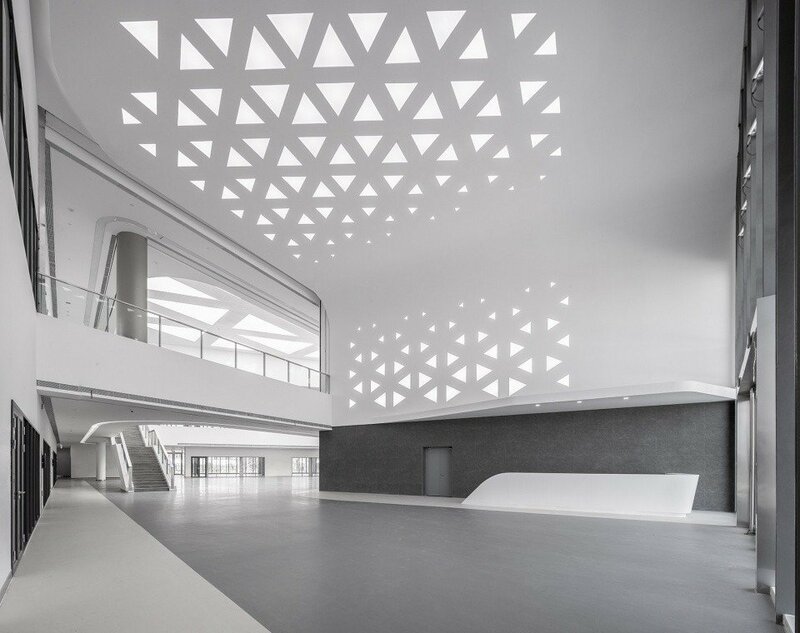 The building facades are made of white metal plates and are partially decorated with gradually hollow patterns, bringing rich light and shadow effects to the interior. 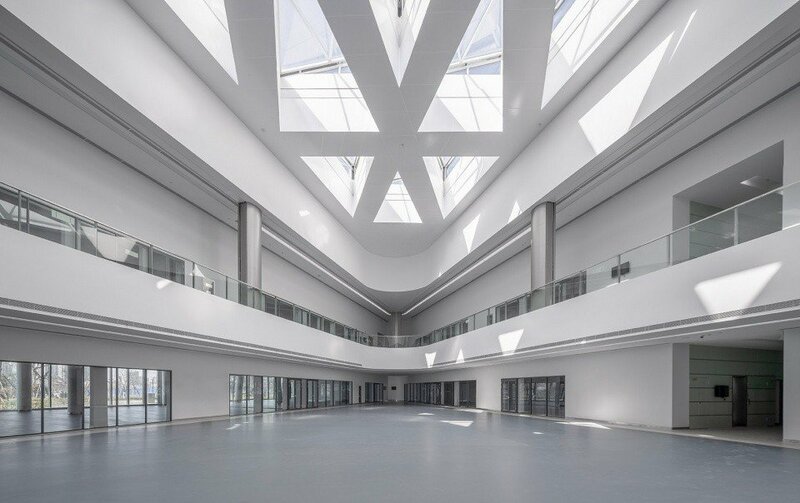 The skylight introduces sunlight into the stadium and enlightens the room. 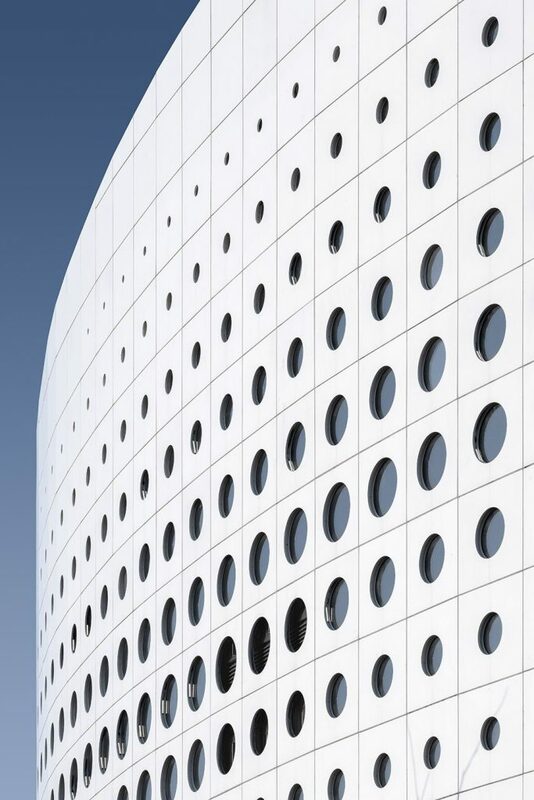 The external gradient theme enters the room and strengthens the characteristics of each monomer through different shapes of themes. 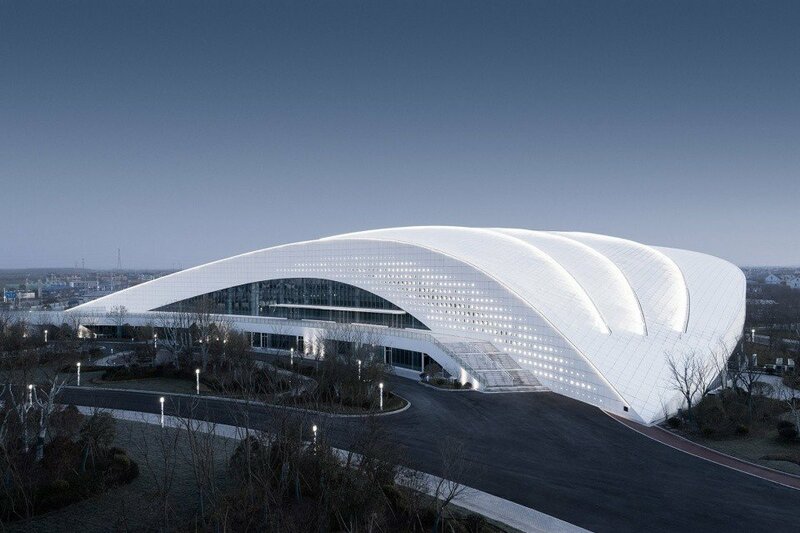 ▼The buildings are shaped with curves and streamline to show the power and beauty of sports. 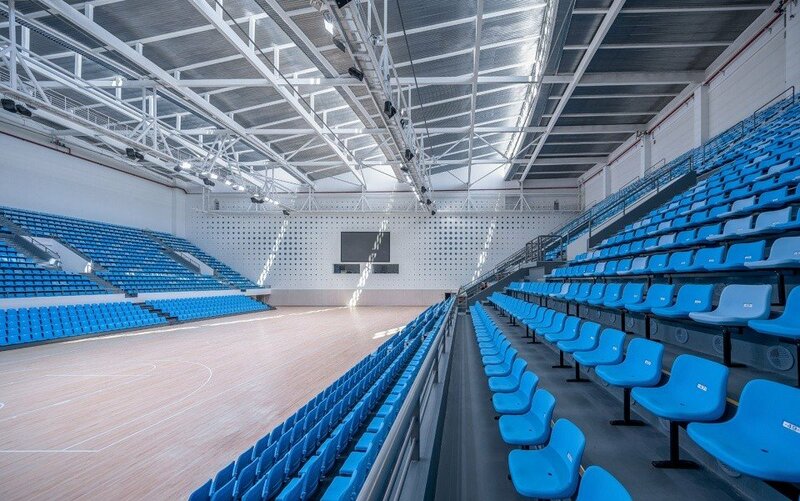 As a county-level sports venue, the Rudong Sports Center does not blindly pursue the full range of functions, but has always implemented the design purpose of “compact sharing”. 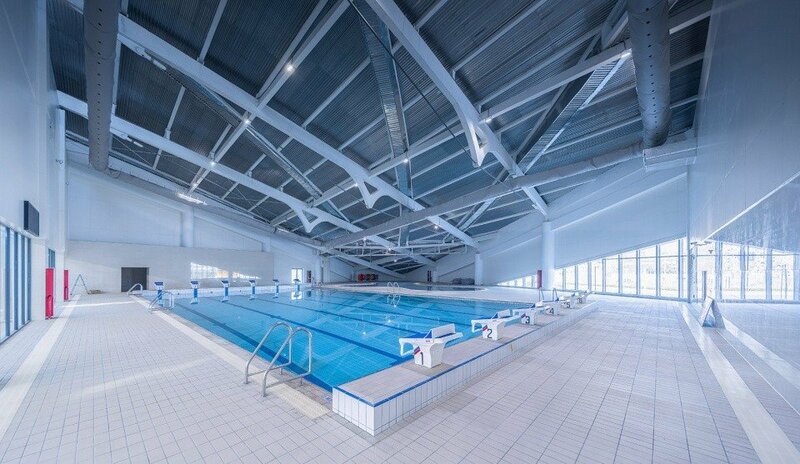 In order to avoid the duplication of expensive sports facilities, we proposed to combine the gymnasium and swimming pool in the pre-design stage to share the competition and training rooms of the two venues and minimize the size of the building. 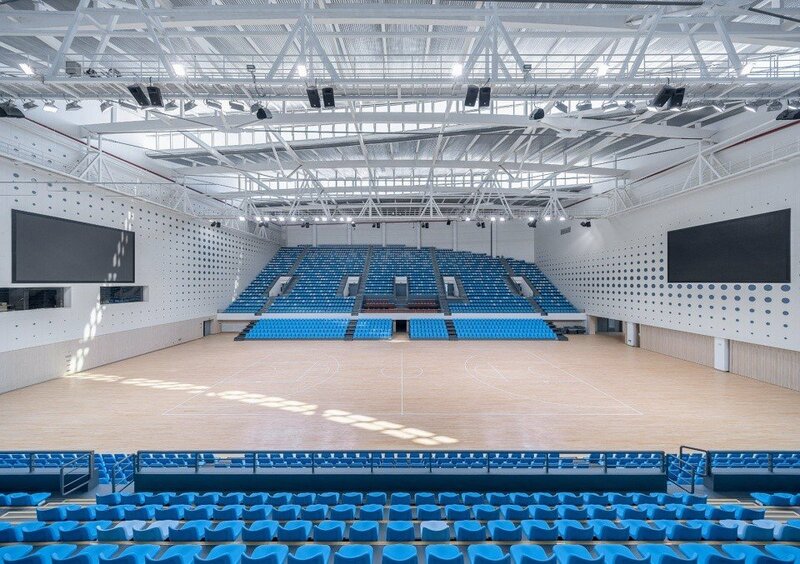 Within the 20,000 square meter building capacity of the gymnasium, it accommodates a 4,000 gymnasium, a training hall, a 50-meter standard swimming pool (with 200 audience seats), a 25-meter training pool and a children’s pool. 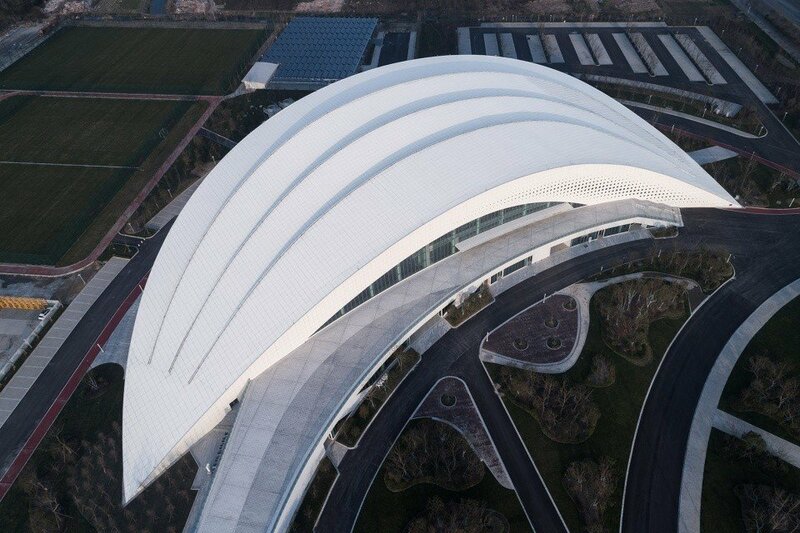 Taking into account the different needs of the venues for the spatial scale, the various spaces are tightly wrapped together with a mid-high and low crescent shape to avoid the phenomenon of space waste in round stadiums. 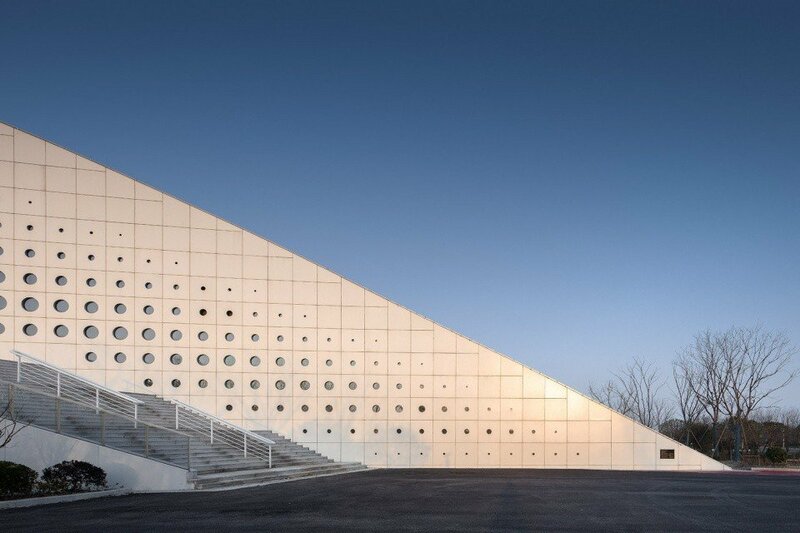 The multifunctional development of sports building is a cult phenomenon. 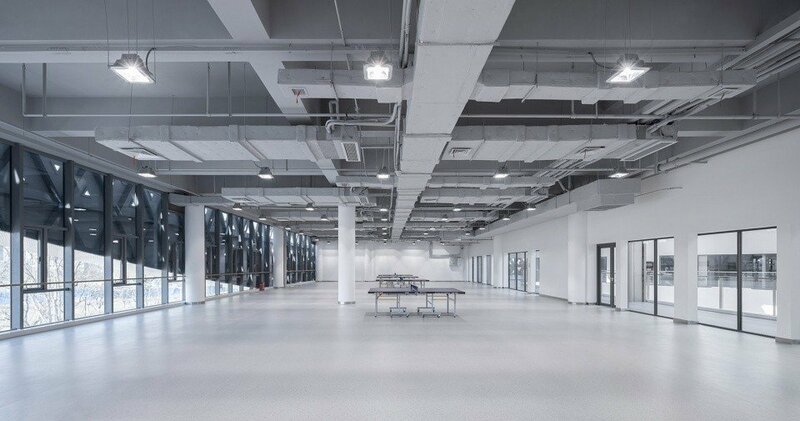 The universal space, complete lighting and audio facilities are very convenient to hold large-scale cultural and commercial activities. 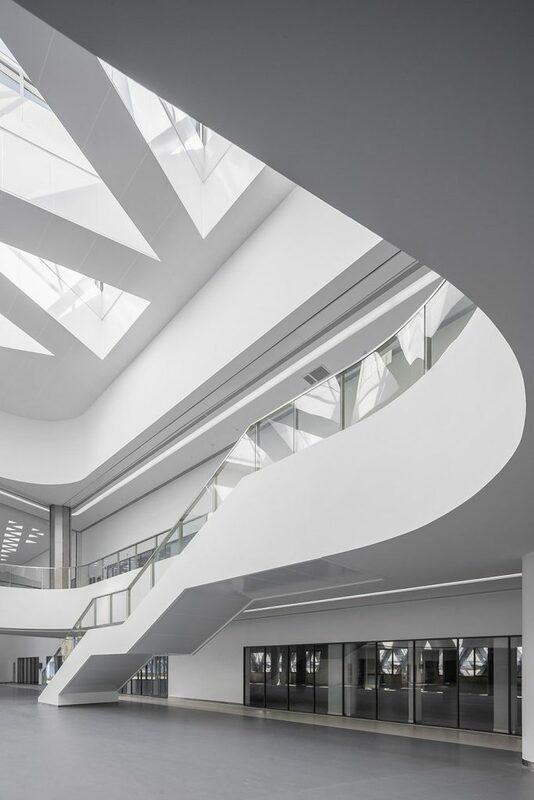 We are happy to see the efficient use of space and embrace future changes in design. 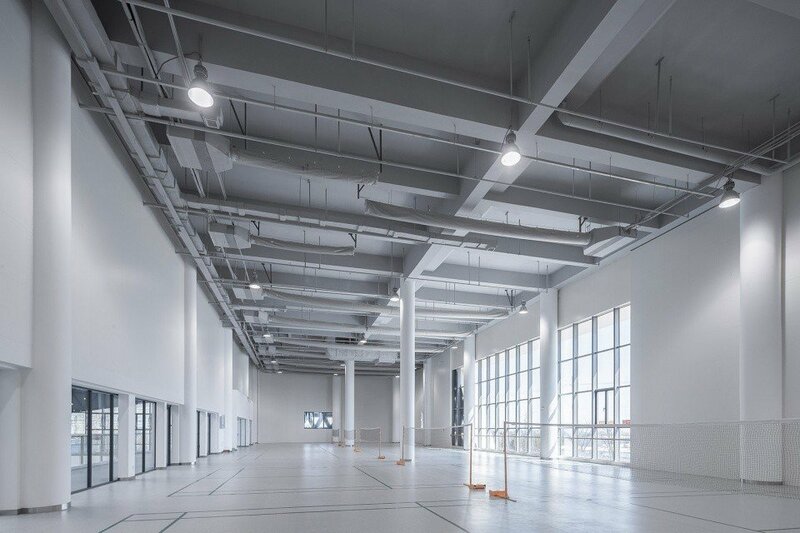 The ground floor of the gymnasium and the training hall is separated by activities, and the door can be opened to form a transparent overall space that can be used for county-level exhibition activities. 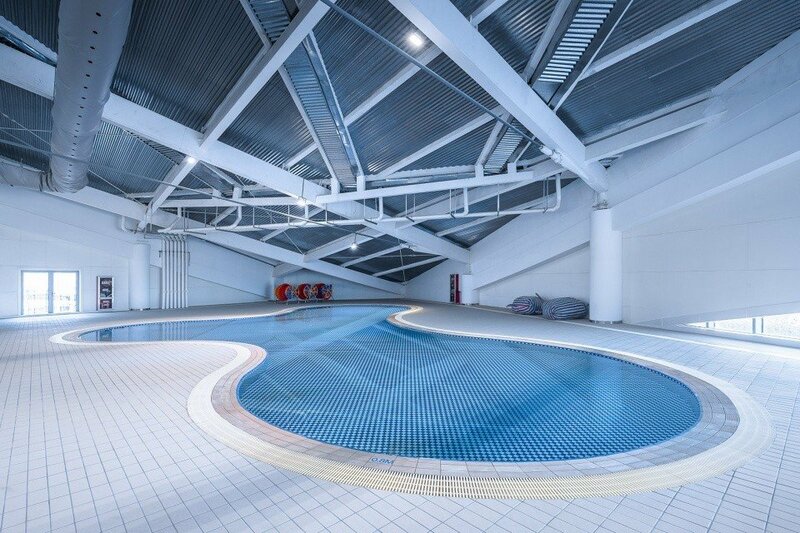 The swimming pool is divided into summer mode and winter mode. 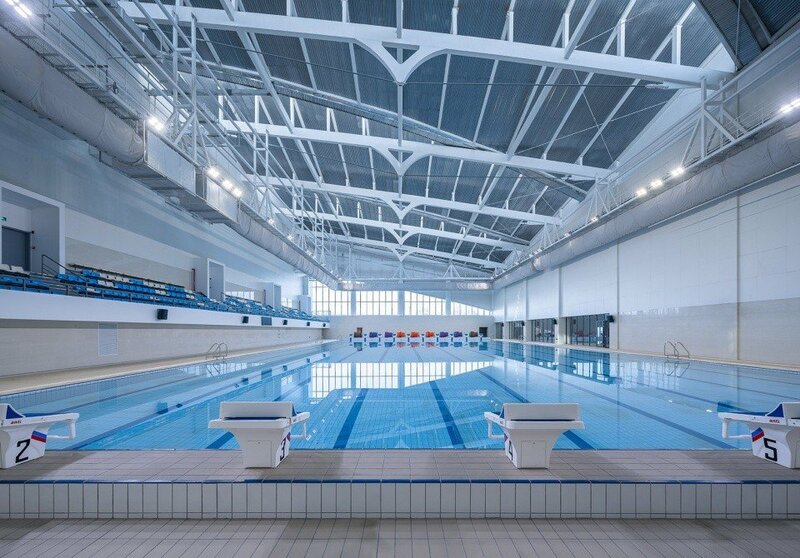 In summer three pools are open at the same time, and in winter the pool area can be divided into two parts through glass doors and partitions. 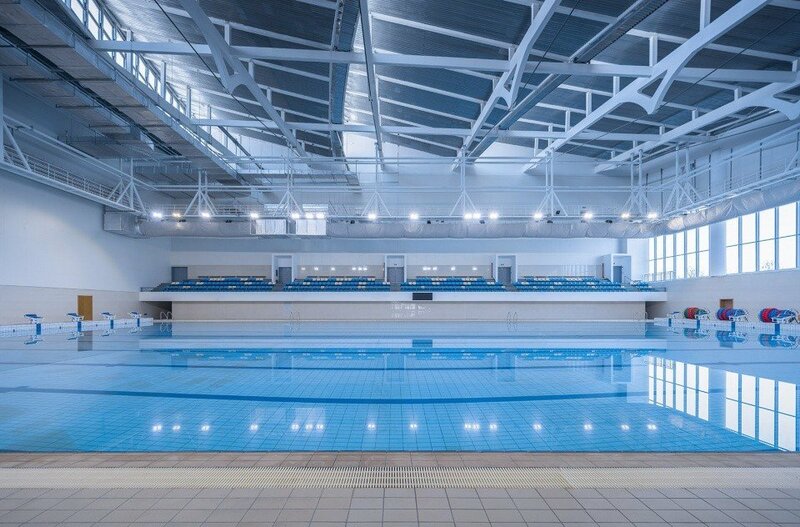 Only the smaller part of the water is opened, while reducing the load of air conditioning and ground heating. 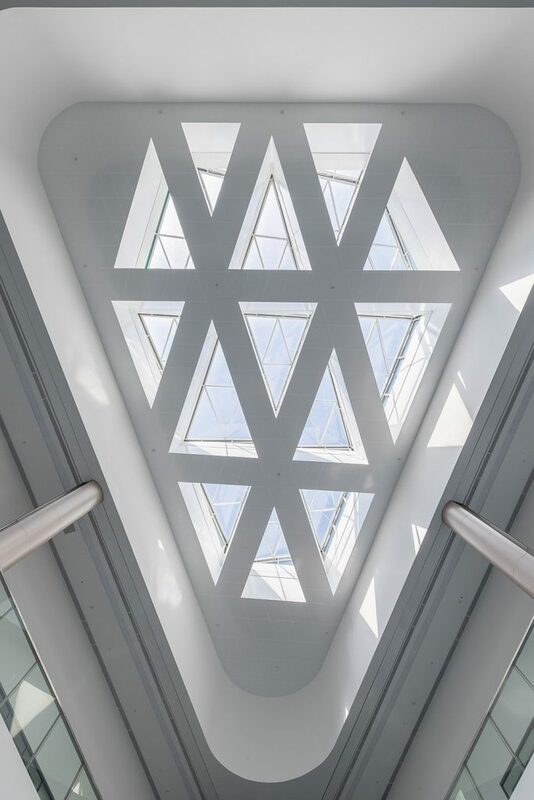 The fitness center’s indoor atrium can also be used to display commercial cultural activities such as publishing. 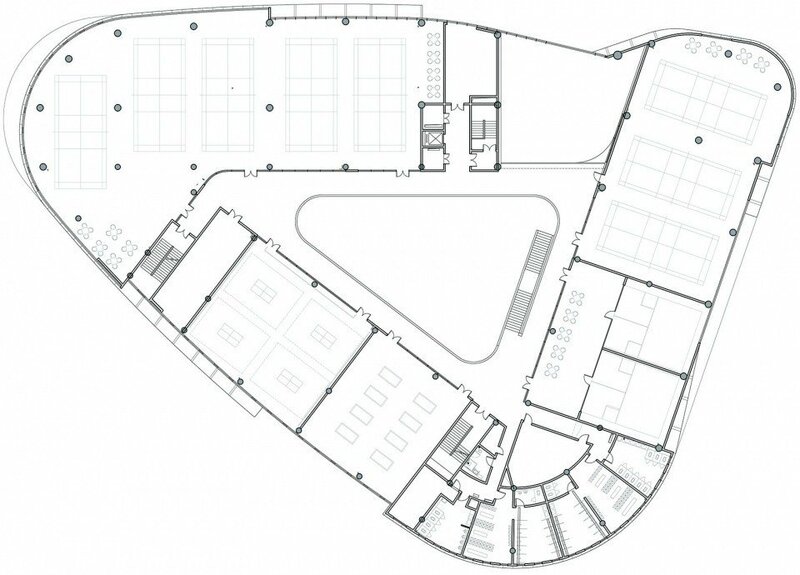 All functional rooms in the fitness center are regular rectangles that can be converted to various functions through secondary renovation after future use.